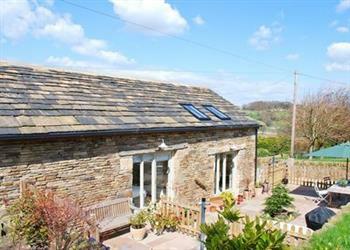 Appleshine Cottage in Almondbury sleeps 4 people. Appleshine Cottage is a grade II listed barn dating back to the 17th century which retains many of its original features. On the edge of the Peak District and close to the North Yorkshire Moors, this is a great base for those who enjoy walking, from a gentle stroll to more challenging walks. Shop 1 mile, pub 1½ miles and restaurant 1 mile. Ground floor: Living room with French doors and beams/dining area/kitchen with breakfast area. 1 twin bedroom with French doors and en-suite shower room with toilet. First floor: 1 twin galleried bedroom with restricted headroom and ensuite bathroom with shower attachment and toilet. Gas woodburner in living room included. Gas central heating, gas, electric, bed linen and towels included. Travel cot. High-chair. Satellite TV. DVD. Stereo/CD. Electric cooker. Microwave. Washing machine, t/dryer and f/freezer in garage. Wi-Fi. Tel-incoming calls only. Large, lawned enclosed garden with patio, sitting-out area and furniture. Bar-be-que. Parking (2 cars). Cycle store. No smoking. Holidays run from Friday to Friday. NB: 7 steps throughout the garden and sloping bank. For a better idea of where Appleshine Cottage is, you can see Appleshine Cottage on the map below. Appleshine Cottage is in North Yorkshire; should you be on the lookout for a special offer, you can find all the special offers in North Yorkshire. It's always worth checking to see what is on offer at the moment. Do you want to holiday near Appleshine Cottage (28659), you can see other cottages within 25 miles of Appleshine Cottage; have a look to find your perfect holiday location.